Spontaneous! Unpredictable! But we listen to each other. 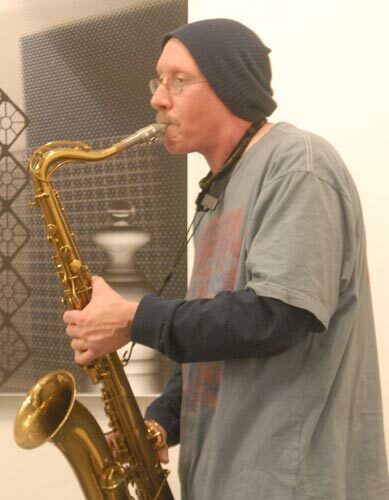 "After playing drums for about fifteen years in a number of unmentional bands, I decided to pick up saxophone in 2002. Self taught, I tried unsuccessfully to find a suitable outlet for my music. Some bands had informed me, 'You can't improvise like THAT.' But jam bands, Ska, straight ahead jazz, just weren't where I wanted to be. Tired of playing music for strictly entertainment's sake, and only wanting to produce a purely honest expression of myself in music, I turned to Free Jazz. With that in mind, if I had never found another living soul, especially here in Milwaukee, I would not have been too upset." "With a stroke of luck, I found Carl Raven in 2004, and we began the completely improvisational Collective Neurosis. With the additions of Rob Schoenecker on trumpet, violin and percussion, and Henry Steinfort on cello, every piece ever played by Collective Neurosis has been completely improvised, putting forth all of our true feelings at that specific moment in time, and has been since the first meeting of Carl and myself in 2004." "I'm sure it sounds extremely self-indulgent, but that's the only way I can approach music at this point in my life. Collective Neurosis was also very fortunate in 2004 to have met WMSE disc jockey Dr. Sushi who hosts the Dr. Sushi's Free Jazz BB-Q show every Tuesday between 9am and noon on 91.7 FM. In that time he has played some 40-odd individual Collective Neurosis pieces on his show. Which brings us to the present, where I have the extreme pleasure and privilege of working with these absolutely amazing members of the Once Now Ensemble."